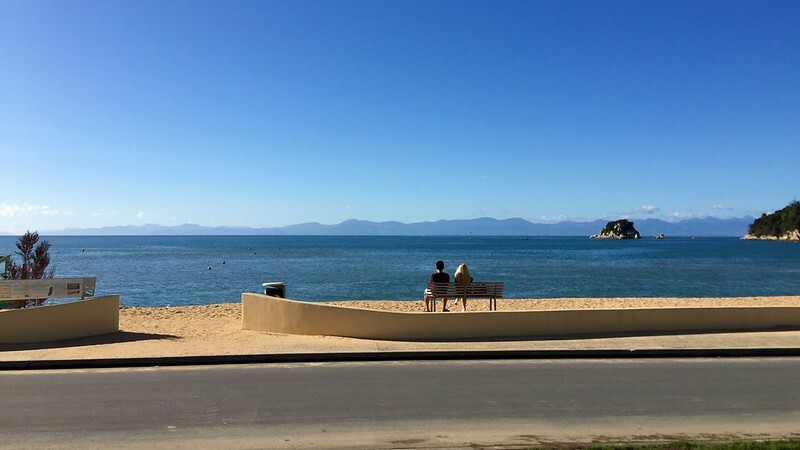 Seduced by the charms of Wellington on a previous visit, we were keen to return this time even though it added considerable complexity to our itinerary. Getting to Wellington from Picton is delightful, as the ferry serenely cruises out through the Queen Charlotte Sound and we did it on a bright sunny morning. Upon entering the Cook Strait the wind picked up sharply to a “walking requires effort” bluster and the outside rear observation deck emptied quickly. Inside there was a revitalising fry up to compensate for our early start, and free wifi to help pass the three and a half hour crossing time—although the coffee was not of the same standard I had come to expect after two weeks of visiting only Lonely Planet recommended cafés. Disembarking in Wellington we immediately realised that campervans are not the ideal accommodation in a city when the nearest campsite to the city centre is an hour’s bus ride away! We worked around this by using Uber (thank goodness for free roaming in NZ on three.co.uk) but it was an inconvenience that the guide book had glossed over. On our subsequent day we just drove into the city. The SatNav made even Wellington’s one-way system straightforward and campervan-suitable parking is available near the Te Papa museum. Having our own transport did allow us to enjoy a few sights not easily accessible from the city centre. The Zealandia wildlife sanctuary was a very worthwhile expedition allowing us to get up close to some native birds (Kākā, Tūī, Kakariki, Hihi plus the flightless Takahē) as well as Tuatara reptiles. The onsite café was excellent too, which is always important at these attractions! It was another fine day too so we also took in the views from Mount Victoria, although driving up there in a campervan was rather exciting and reminiscent of some of our South Island driving experiences! We even managed an hour in Te Papa just before it closed—it remains as excellent as ever. After the rural and remote pleasures of the South Island, it was also a lot of fun to enjoy some city life. We were there for the weekend so there was a buzzy atmosphere wherever we went. One relaxed afternoon was spent in the garden of Fidel’s café in Bohemian Cuba Street, then later that evening we had cocktails at The Library, a fun theme bar who did not bat an eyelid when we arrived carrying a baby in a hiking rucksack and asked for a table. After dinner we found ourselves in Midnight Espresso, a late night café with a great vibe and a selection of vegan cake so large that Rosie could not eat all items then-and-there and some had to be taken away! After the vibrant weekend scene in Wellington we expected our final night in Auckland, a Monday, to be rather quiet. The guidebook had also suggested the CBD where we were staying was not the most exciting part of the city but when we ventured out of our hotel in search of dinner about 6:30pm the streets were nicely lively. With a little bit of luck (our first choice of restaurant was a little too busy) we found ourselves having dinner at Masu. The Japanese food was excellent, accompanied by some lovely NZ wine and there was an enjoyably buzzy atmosphere—more like a Thursday or Friday than a Monday. It was a great note on which to end the holiday. The receptionist at the campsite had recommended two options for us as being suitable for a baby. The first was to leave the boat at the first beach, Anchorage, and walk some loop trails, and the second to go all the way to Awaroa on the boat and then an easy two hour hike back to get picked up at Tonga Quarry beach. We chose the latter as it seemed to be the more active option and we were feeling that the activity to driving ratio in our holiday so far had not been as high as we wanted. This turned out to be a very good choice as we later saw that the beach at Anchorage was hosting a group of about 60 boisterous school children whereas at Awaroa only one other couple disembarked the boat with us and we practically had a long beach of golden sand to ourselves. It took about 90 minutes to reach Awaroa. The sun was warm so there was no problem sitting out on the too deck taking photos the entire way. The scenery is fairly homogenous: turquoise blue water meets golden sandy beaches or rocky cliffs and then dark green native forest climbs rapidly up steep hillsides into deep blue sky. There were a few interesting rock formations to provide some visual focal points for the photographs but the highlight was watching some seal pups play and splash in the rock pool of one of the islands. It was blissfully relaxing sitting in the warm sun, being refreshed by the sea breeze, as we cruised along enjoying the scenery—plus someone else doing the “driving”. We disembarked and picnicked at Awaroa. The temperature was just perfect, warm enough to sit in the sun on a handy drift wood log, but not so hot that I felt instinct to find shade. The beach was also mercifully and surprisingly free of sandflies—this day was going really well. The first part of our walk was down the beach, then we had to go inland through a forested section. This took about an hour and was not particularly interesting—there were no good views until just before the end, as we approached Onetahuti beach. Walking along Onetahuti beach was a great way of appreciating the picture postcard warm golden sand and clear blue waters again, although it was a bit busier than Awaroa, 20-odd people perhaps on a few hundred metres of sand! A short cliff top track within sight of the water took us round to Tonga Quarry beach for our pickup, and we had just enough time to cool our feet in the crisp, cold, clear water. The sand was unusual: it had a hard and “glassy” texture but felt great on our hard-walked feet and when I had to put my shoes back on it brushed off really easily and gently, no sandpaper effect! The pick up was a few minutes early which was a little sad as we were enjoying a rest after our walk but the scenery on the trip back was still good. The final 45 minutes of the cruise were not so relaxing after we picked up the aforementioned party school children in high spirits fuelled by fresh air and sunshine. Fortunately we were able to recover from this with another coffee at the peaceful beach front café once we arrived back into Kaiteriteri. At the height of the gold rush in the late 1860s Hokitika was one of the busiest ports in New Zealand. Today it is a small but worthwhile rest stop for the road-weary traveller. There is a long beach with pounding surf on which to stretch your legs but the highlight is the small and well curated museum in the grand former public library. This includes exhibits on the Maori history of greenstone (the major source of which is in this area) as well as the curious history and culture of whitebait fishing on the west coast. 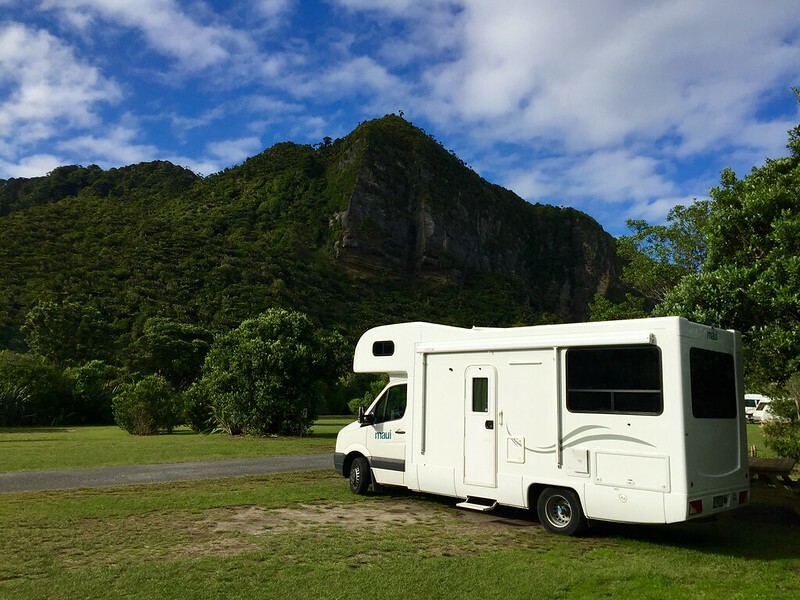 We overnighted at a camp right next to the beach at Punakaiki. The roar of the surf was quite a soundtrack, and much preferable to the drumming of rain we had previously. We woke to glorious sunshine and finally we could see the peaks of the mountains! The huge waves meant the blowholes at Punakaiki Pancake Rocks were on form today and the sea sparkled in the sunshine. Many a tourist could be heard taking a sharp intake of breadth or emitting a ‘wow’ as a wave smashed onto the rocks below and made an awesome spray pattern. Usually this was followed by said observer being coated with a refreshing fine mist of sea water too! The drive along the coast here was very beautiful with a mix of beaches and off-shore rock formations. Later in the afternoon we turned inland following the Buller River Gorge. This was also very scenic, although some of the single lane road sections around sheer cliffs were rather exciting in a campervan! New Zealand’s West Coast is famous for its rain, of which we experienced a lot, but it also gets a lot of sunshine and then the scenery really sparkles. Travelling through the region requires a lot of driving as the road twists and turns up and down the mountains. However the views are excellent (except when it is really raining hard!) and picturesque picnic spots at which to pull over and chill out are frequent (assuming you are hardy enough to not mind the sand flies). There are also a variety of short trails through the temperate rain forest. We stopped at one called the Blue Pools—a bridge spanning the confluence point of two mountain rivers of crystal clear water. Haast is a convenient spot to overnight between Wanaka and the Glaciers. Despite being a very small town, the visitor centre is really informative, with a large room full of displays and a video about the geography and history of the region. At Fox Glacier we headed straight for the famous Lake Matheson. We knew it was the wrong time of day to get the still waters required for the lake to mirror the mountains but the Lonely Planet raved about the café there and it was lunchtime! The food did not disappoint, and it was not particularly crowded so we had a very relaxed time eating outside in the deck admiring the cloud-shrouded mountains. Sadly the cloud did not lift so we were unable to see Aoraki / Mount Cook at all, let alone reflected. After a post-walk-around-the-lake coffee (finally the baby picked a good time and place to want food! ), we hiked up the terminal moraine to get a view of the Fox Glacier. This was a fairly challenging 90 minute walk carrying 7.5kg of baby over rough ground but the dramatic and dynamic nature of the landscape was worth it. The drive to Franz Josef required navigating another exciting mountain road and as we arrived at the turn for the glacier walk there was a beautiful rainbow glistening in the sunshine. Despite the strong evening sunshine it too late to make the 90 minute walk up to the glacier and back so we crossed our fingers and hoped the fine weather would continue the next morning. The end of daylight saving time meant some extra time in bed in the morning but heavy rain woke us early—the weather and forecast was not promising. Undeterred we planned to carry on, but then realised that the cloud cover was so low, it as unlikely we would see very much on our walk. Engaging plan B and hoping the cloud cover would lift later in the morning, we paid a visit to one of the few indoor attractions in the area, the West Coast Wildlife centre. Here we saw two kiwi chicks of the very rare rowa variety, 7 and 9 weeks old. They are nocturnal so the enclosure was dark but it was very cool to watch them snuffling around, probing the earth with their beaks. The rest of the centre had some information and videos on how they are conserving the kiwi population which were good, and then a display about glaciers that was mostly video-based and consequently required much patience to follow and understand. Finally there was a section on the history of the area which was again poorly presented such as to require considerable effort to extract the information. The rain had now stopped although the cloud cover remained low but after one of Jimmy’s Famous Pies (delicious), we decided the glacier had to be seen. As we arrived at the car park the rain resumed, harder than ever. By the time we had changed into our waterproofs, it had become torrential—like a monsoon—and after we had seen other people returning to their cars soaked to the skin, we decided that the days it would take to dry out our stuff again was not worth it given the high likelihood of there not even being anything worth seeing through the rain! It proved a good decision as there was no let up in the monsoon rains for several hours, so we had a tasty lunch of pasties and Danish pastries from the Picnics bakery, and set off North to our next destination. On previous trips to New Zealand I had skipped Wanaka in favour of spending more time in high adrenaline Queenstown and the superlative Fiordland. This time our itinerary made Wanaka the ideal stopover between Dunedin and the West Coast. The lakeside setting is very pleasant and beautiful even on a cloudy rainy day, although sadly the visibility was too low to see the full splendour of the mountains on the day we visited. After a leisurely walk around the lake admiring the views we climbed up for about 15 minutes to reach Rippon winery. Not only do the views make the climb worthwhile on its own, the wine tasting was well explained and somewhat unusually included sampling the same wine from different vintages so it was possible to see how a particular wine would mature if cellared. In the evening we had a choice of a wide variety of eating places but went with the Lonely Planet recommended Red Star burgers. The menu offered an interestingly different selection toppings and the execution, along with Cajun-spiced chips, was perfect. Our itinerary required us to move on after one night which was a bit sad. Wanaka is a charming and peaceful destination with high quality facilities, good walking easily accessible from the town, and plenty of other activities available—it would have been easy to while away a few leisurely days here. Last Monday was my first trip to Christchurch (New Zealand) since the devastating earthquakes of 2011. We had been warned in advance not to expect very much but on the taxi from the airport all seemed quite normal, albeit with extensive building works. Then suddenly the ruins of the Victorian cathedral appeared in front of us and we realised that the empty blocks we had been passing were not some unused land between airport and city centre, it was the former city centre, now mostly demolished. A sobering moment, as the taxi driver explained how just clearing the unsafe—but still standing buildings—had taken years to complete safely in part due to the amount of asbestos they contained. The next morning I took a photo walk around Cathedral Square. It was eerily deserted except for a few other like-minded camera wielding tourists but then I remembered it was a public holiday and so not unexpected that a CBD would be quiet at 9am. The cathedral and two other buildings in the square are still derelict, fenced off and slowly being reclaimed by nature. Surrounding the square are wide open spaces, punctuated by the occasional buildings standing out like tall poppies in a field. A couple of these buildings are marked “to go”, but others are shiny new edifices including two new business hotels and a modern office block. Away from Cathedral Square, the former main shopping street was still closed and under scaffolding but elsewhere there were signs of new life. One street had a row of gaily painted boutique shops and the former grand colonial Post Office building is the home of C1 Espresso, a hip café serving great coffee and interesting food, delivered to your table through the pneumatic tubes leftover from the building’s previous life. To get there required walking through several quiet streets of closed up and scaffold-clad buildings so finding such a vibrant venue amongst all the reconstruction seemed like a good analogy for Christchurch as a whole—exciting new shoots of life appearing in places but overall not yet in full bloom.